We have had masses of building work done over the summer, hence my silence on these pages. Some days I had a kitchen to use, other days not so much. Once the Aga was decommissioned I moved onto a two ring gas hob (no oven) and once that was a goner it was braais or picnics. There have certainly been some stressful moments and I have deposited more money in the swear box than I care to think about. My poor husband and children have had to put up with a lot of unusual suppers from a rather mad-eyed cook but it was worth it and we now have a fabulous new kitchen. The thing about being put on the spot kit wise is that it really focuses the mind. If all the gadgetry has been boxed up (or just covered in dust) and there is only a pan to hand then one must make do. 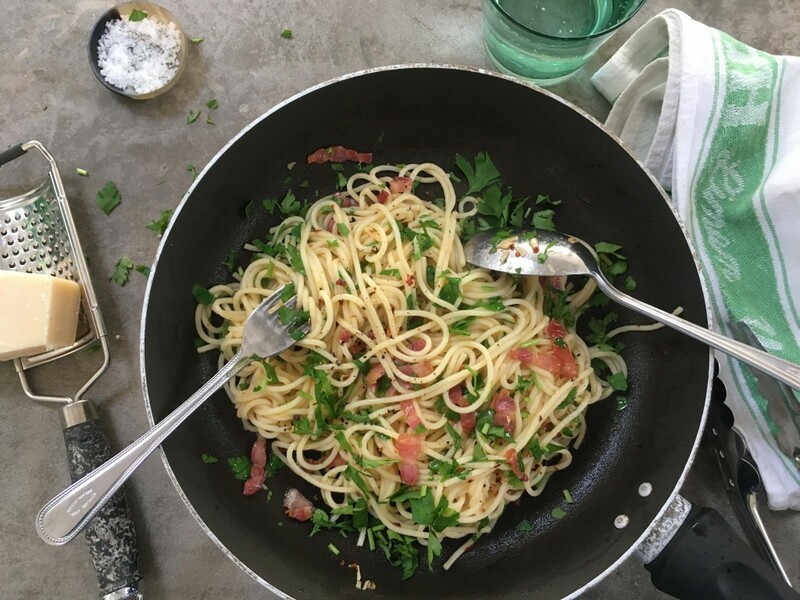 One such recipe that came into play was this pasta with bacon, garlic, chilli and parsley. Comprising of store cupboard and garden ingredients this can be reliably whipped up with the minimum of equipment, time or energy. On one occasion I also added a pile of halved cherry tomatoes because I had some that needed using up. It is certainly just as good without and I wouldn’t use tasteless winter (or jetset) tomatoes for the sake of it. I highly recommend making this whether you are enjoying building works or not – it is cheap, very cheerful and everyone, particularly the children love it – what could be better (apart from a new kitchen). Get your pasta cooking in a large pan of generously salted water. Put a tablespoon of oil in a large frying pan and snip (I find scissors easiest here) the bacon into it. Cook until just turning crispy then add the garlic and chilli, stir it around over a gentle heat ensuring the garlic doesn’t brown. When the pasta is done, drain it retaining a little of the cooking water. Tumble the pasta into the frying pan and mix well with the bacon, garlic and chilli adding a splash or two of cooking water to keep the whole thing quite slippery. Chop the parsley over the top, season well and serve with parmesan if you like. This amount is enough for two adults and two children. I was asked recently for more supper recipes, easy, quick, everyday numbers to resolve that daily dilemma, what are we going to eat tonight? Several ideas came to mind but this is the one I was cooking that night for supper and in itself presented me with a problem. Could I actually offer this up as a recipe? As you will see it contains very few ingredients and furthermore part of it is from a recipe I created last year, the Herby Ricotta with Pickled Cucumber (September 2014). 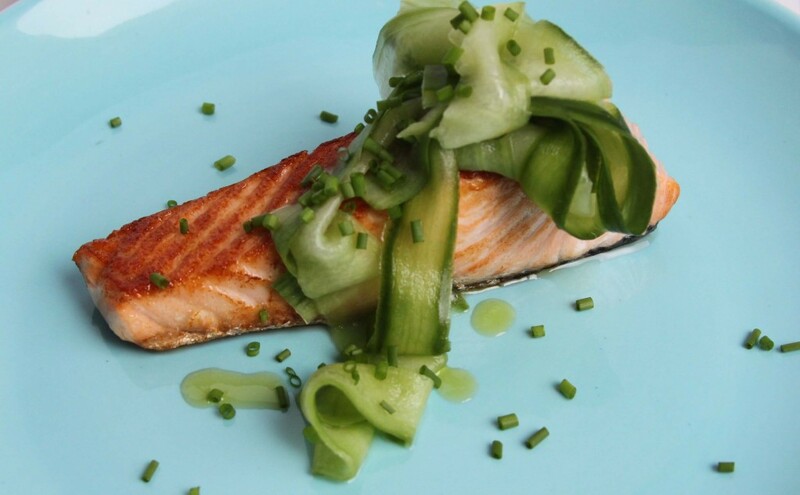 Surely no one needs the suggestion of salmon for supper but maybe the pickled cucumber is a bit of a departure? Indeed the crunchy, sweet and sour elements of this go splendidly with the rich, oily salmon, quite a partnership. Anyway I dithered for a bit before realising how mad I sound. Get ahold of yourself I said. This is not a dilemma, choosing names for your children, deciding which house to buy, what career to pursue – these could all be considered dilemmas but not whether this can be justified as a recipe or not. That it is unbelievably quick and easy is hardly a problem; nor that it requires a shopping list you could probably fit on a stamp; most crucially it is extremely good and of course, good for you. If you aren’t a carbo phobe it goes perfectly with glorious, fudgy Jersey royals and a big green salad, heavy on the fresh mint, would also be just the ticket, a fab supper. I made extra of this last week and had it cold for my lunch the next day. I ate it with a salad but couldn’t help thinking it would also make a stellar filling for a sandwich. Put the sugar and vinegar into a shallow bowl with a pinch of salt and leave to dissolve. Using a vegetable peeler, take long slices of cucumber avoiding the watery seeds in the middle and add to the bowl. Leave for half an hour, stirring occasionally, for the cucumber to “pickle”. Meanwhile brush the salmon fillets with the oil on both sides and put skin side down in a hot pan. Leave for 5 minutes before turning and cooking on the other side for a further 5 minutes – this should be just right but cook a little longer if you prefer or your fillets are huge. Sprinkle with the chives and serve with the pickled cucumber. Enough for 2 but easily doubled, tripled….